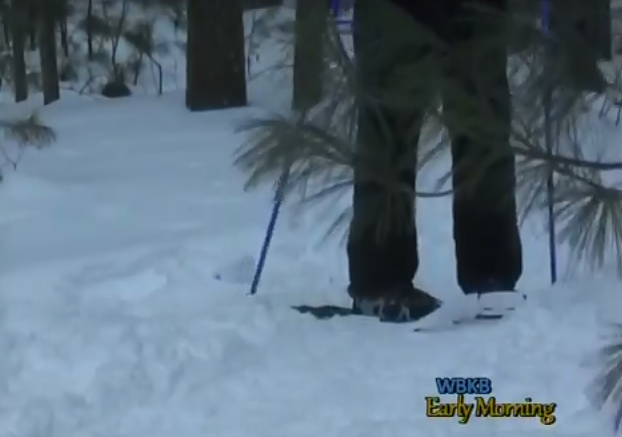 In the spirit of New Year’s resolutions, the Michigan DNR is encouraging Michiganders to take part in Shoe Year’s Day. As many of us pledge to be better versions of ourselves for 2017, a good portion of New Year’s resolutions center around healthy habits and exercising more frequently. Let Michigan’s great outdoors inspire your New Year’s resolution by taking part in Shoe Year’s Day hikes throughout state parks across Michigan. “The event takes place at Besser Natural Area. And what they do is, there’s a fire set up at the edge of the parking lot, and they have snowshoes that are available for people to try out. They pretty much direct you on where to go on the trail, it’s kind of a self–guided hike but it’s a big looped trail so it will take you around and bring you back out so you can join everyone at the campfire when you’re done. They usually have hot chocolate and some snacks and goodies and things like that for everybody that participates,” says Stephanie Yancer, Social Media Coordinator for the DNR. From December 31st to January 8th, organized hikes will be taking place at state parks and recreational areas near you. For those in Alpena County, Rockport Recreation Area will host a hike January 7th at noon. For Cheboygan County residents, Straits State Park will host another hike on January 7th at 5:00 pm. All Shoe Year’s Day hikes are free, however a recreational pass is required for vehicles entering Michigan state parks or recreation areas. For just $11 a year, the recreational pass may be the most affordable gym membership that additionally gives access to 103 state parks and 138 state forest campgrounds.